The need for an endowment at St. Mark’s was realized by the church leaders in the 1800s as the parish grew in size and responsibility to the growing city of Minneapolis. This held true for rector the Rev. Thomas Bucklin Wells’ wife, Annie Jonas Wells, and the women of St. Mark’s “ladies work”, the Nichols Mother’s Club, which carried on Annie Wells’ vision, at the previous locations of St. Mark’s and the current location on Loring Park. Those entities formed the foundation of what was to become the Wells Memorial. In the early days of the parish and city, it was Germans, Scandinavians and Eastern Europeans who were in need of language and social services-which were supplied in part by the Wells Memorial, one of many settlement houses in the late 19th and early 20th centuries, and now the Wells Foundation. Today, they are Somalian, East African, and Hmong, among others, and the Minneapolis School System has over 200 different languages and cultures represented. The faces have changed but not the needs. On construction of the new church in 1910 in Loring Park the Rev. James Edward Freeman gave impetus to the endowment project, gathering gifts large and small, and it has grown through the years. The contributions benefited St. Mark’s, the Diocese (now The Episcopal Church in Minnesota) and Wells Memorial, as well as other historically Episcopal organizations such as St. Mary’s Hall, Shattuck School, St. Barnabas Hospital and Episcopal Church Homes. We are no less at the crossroads of the busy city and those in need as in Annie Wells’, Baxter’s and Freeman’s day-and no less responsible for spiritual and material needs for others as well as ourselves. The stories below describe past benefactors to Wells Memorial and the Wells Foundation. Click on each of the links below to read their stories. Sources for the narrative and photos are listed here. Clive Talbot Jaffray (1865-1956 — at left), a native of Ontario, Canada, was CEO of the First National Bank and Soo Line Railroad and originator of the Jaffray Trust. Clive married Madeleine Palmer (1862-1954 — below), with whom he had three sons: Clive Palmer Jaffray (1892-1971) and twins Frank Burton Jaffray and Walter Frederick Jaffray. 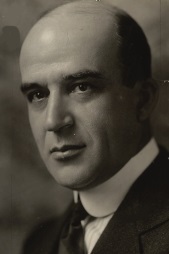 In 1914, Clive T. Jaffray’s son Clive Palmer Jaffray formed a partnership with Harry Piper Sr. and, briefly, R.G. Hopwood, to form Piper Jaffray and Hopwood, later Piper Jaffray Inc. The Jaffray family was an integral part of the early years of St. Mark’s. In the 1920s the “Wednesday Club” of St. Mark’s provided and furnished the “Jaffray Chapel” at St. Mark’s, in memory of Mary Freeman Jaffray (1891-1923). She was the first wife of Clive Palmer Jaffray and the daughter of Rev. James Edward Freeman. Dr. Freeman had been installed by Bishop Edsall as Rector of St. Mark’s in 1910; and it was Freeman who oversaw the construction of St. Mark’s on its current site by Loring Park. The Harrington Trust is the largest of the trust funds of which St. Mark’s is a beneficiary. Charles Harrington (1855-1928) was a pioneer grain merchant and president of the Van Dusen Harrington Co. A native of New Berlin, New York, Harrington came to Rochester, Minnesota in 1871 as a telegraph operator for the Northwestern Railroad. In Rochester, he met G.W. Van Dusen, who hired him for his grain business; and in 1889 they organized the Van Dusen-Harrington Co., where Harrington was President. In 1928 the firm was sold to the F.H. Peavey Co. which in 1982 merged with Conagra. St. Mark’s Church was his primary interest. An active leader at St. Mark’s, Harrington was junior warden for 17 years and senior warden for 17 years at St. Mark’s Cathedral. His family home at 2540 Park Avenue was given to the Shriners, who used it for many years, and it is now part of St. Mary’s University. His charitable gifts, a staggering $1.5 million in 1928 out of a total $3 million estate, were given in memory of his late wife, Grace Ross Harrington (1854-1919). The Boutell Trust was a gift from William T. Boutell (1864-1930), a furniture dealer in Minneapolis and contemporary of George Draper Dayton of the Dayton’s Department Store. Boutell was a member of Hennepin Avenue United Methodist Church, and was active with many charities, as evidenced by his extensive donations. The Frederick Wells Fund was given to St. Mark’s by Mary Drew Peavey Wells and Frederick Brown Wells (1873-1953), who was the son of St. Mark’s rector the Rev. Thomas Bucklin Wells and Annie Elizabeth Jonas Wells. The Wells family originally came from England in 1635 and settled in Ipswich, Massachusetts. 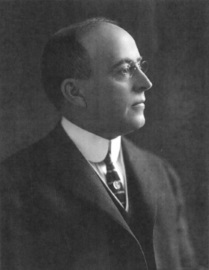 Frederick Wells was later president of F.H. Peavey Co.
Mary was a member of the Peavey Co. grain family, which (as noted above) has merged with Conagra in 1982. Their children were Frederick Brown Wells Jr., Mary Peavey Wells, Mrs. Loring M. Staples, Frank Hutchison Wells, and the Rev. Thomas Bucklin Wells. The Rev. Thomas B. Wells was rector of St. Mark’s church – now St. Mark’s Cathedral – in the 1880s, and it was his wife, Annie Elizabeth Jonas Wells, who started what was to be known as the Wells Memorial, now Wells Foundation. Isabella Boise Turner Cooke (1857-1937) moved to Minneapolis with her husband Elbridge C. Cooke (at left) in 1883, and became a member of St. Mark’s in 1904. She made large bequests to St. Mark’s and Wells Memorial, which at the time was a settlement house. Her obituary mentioned that she was a trustee of St. Mark’s. She supported the endowment fund and the parish house mortgage. Her estate gave bequests to the Visiting Nurses Association, Episcopal Cathedral Foundation in Washington, D.C., Minneapolis Society of Fine Arts, Diocese of Minnesota, St. Mary’s Hall in Faribault, Wells Memorial House and the Episcopal Church in the U.S.